Josenhans FF ~ CBBT Big Fish Report! 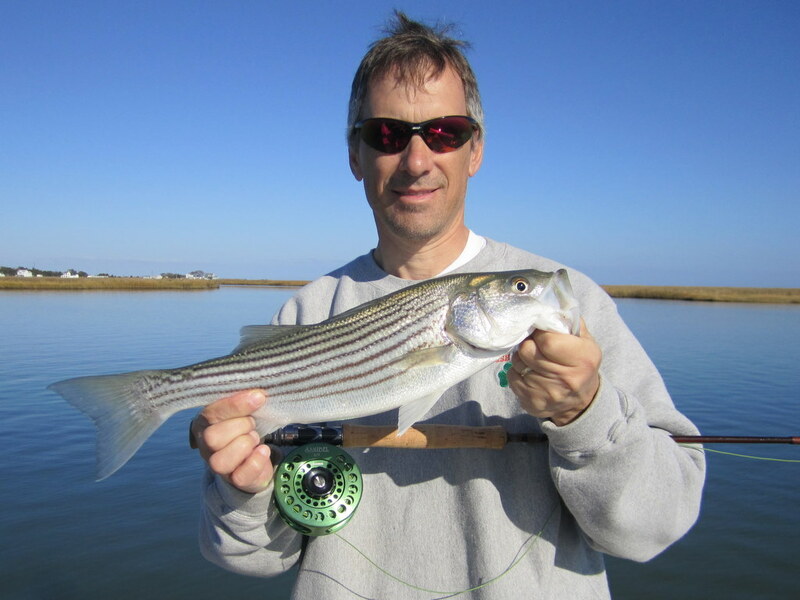 Matt Roach, Eric Bleicher and Mike Robertson joined me for a much-anticipated trip to the CBBT. After a fruitless couple of hours looking for fish and bird activity in the ocean, we moved on to plan B and returned to the bridge tunnel. I’ll be honest, rockfish were hard to come by. 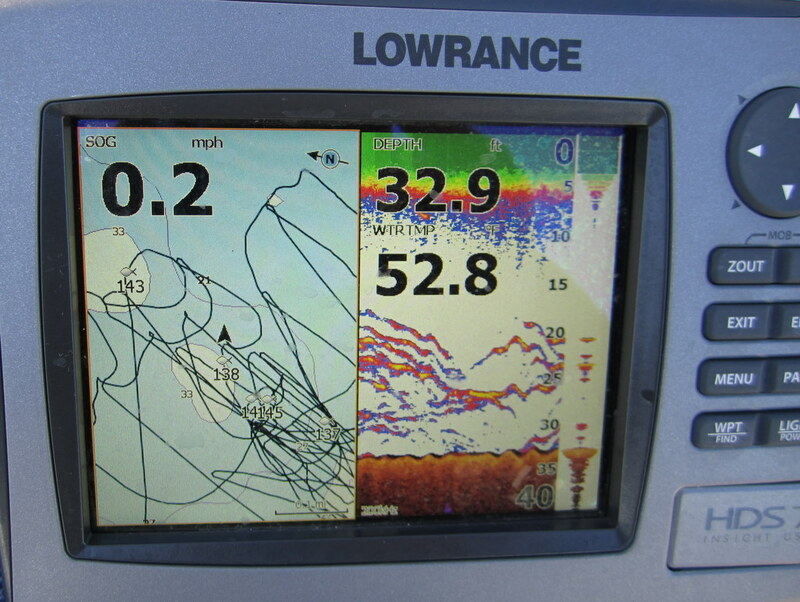 And while we didn’t exactly fill the boat, but we did manage a couple of nice stripes around the islands and pilings. 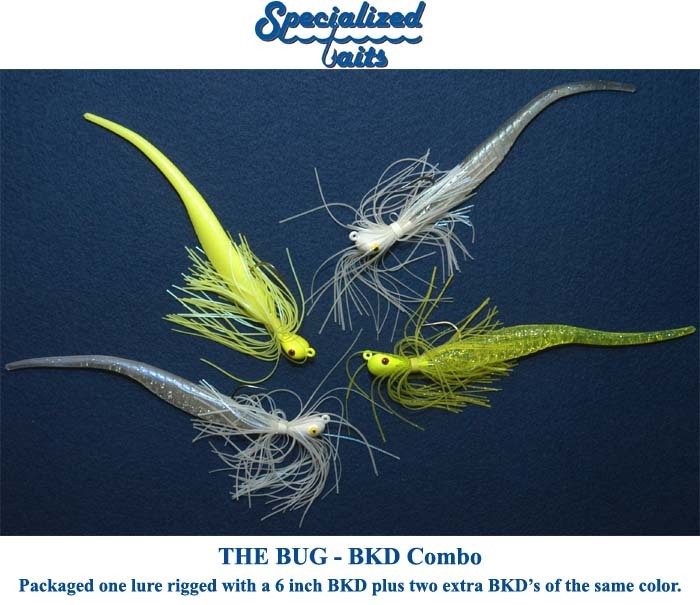 Specialized Baits “The Bug” in 1.5 oz. with a 6-inch BKD was the hot lure. Eric had the hot hand early, but Matt’s 43-inch fish took top honors. 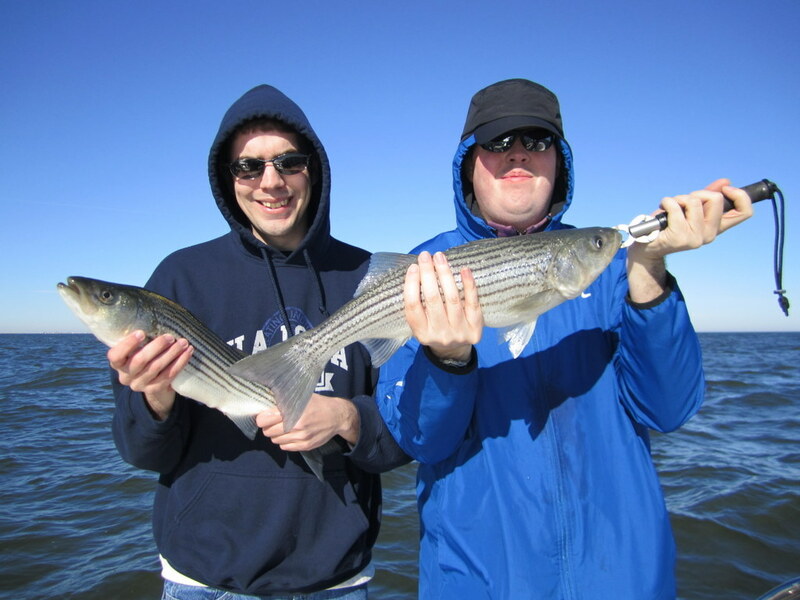 Both stripers were a personal best for the guys and the fish were released after a quick photo-op. I would like to take a moment to personally thank each and every one of you who continue to make Josenhans Fly Fishing possible. For my e-newsletter and blog subscribers, I hope you have enjoyed reading my fishing reports as much as I have enjoyed writing them. To all of you who have fished with me, or are planning a future trip, a heartfelt “thank you.” Your continued support has kept my boat on the water for close to twenty years. From my family to yours, I wish you all a very Merry Christmas and Happy New Year! Fished the CBBT yesterday. 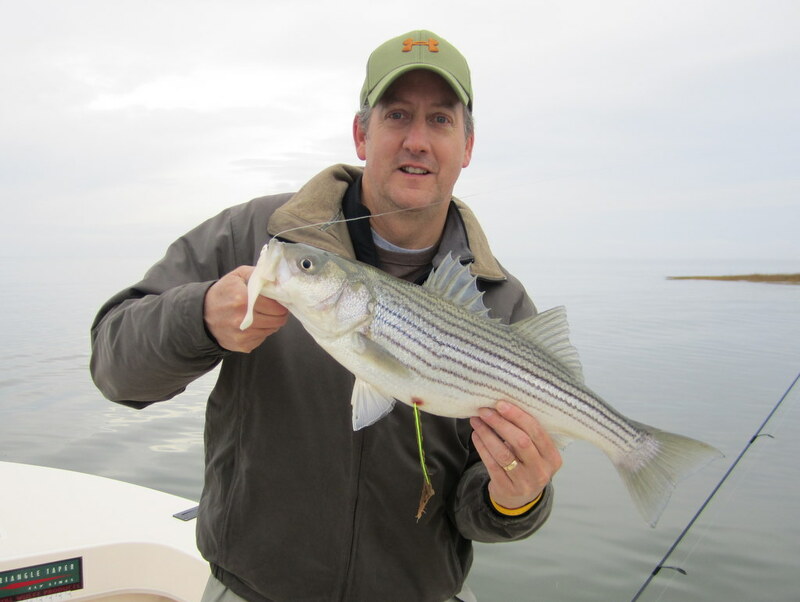 Beautiful day with maybe 20 rockfish to 26 inches. Not great – not terrible. 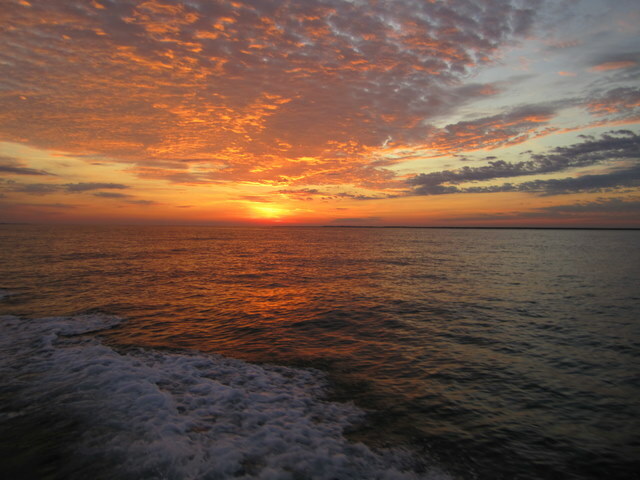 Beautiful sunrise greeted us at Fisherman’s Island. And a windy November it was.. The greatest challenge of the past month was not catching fish, but juggling the schedule to accommodate everyone who wanted to fish. A stiff breeze was relentless! I know some of you were moved three times before we were able to hit the water. Thanks everyone for your patience and flexibility. Now on to fishing. 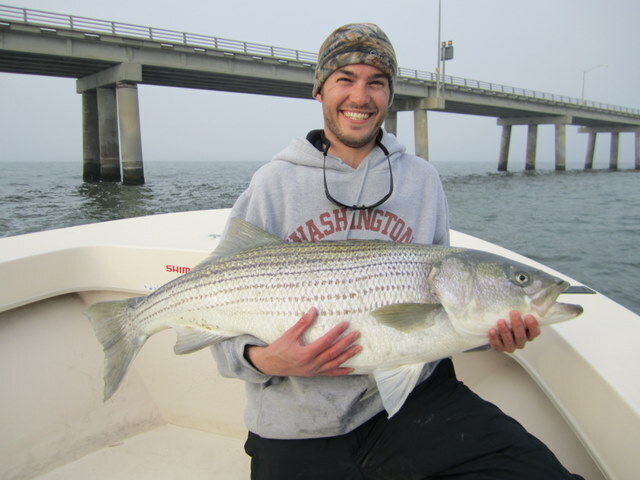 An early November trip brought Tim and Matt King down to Crisfield for some late fall rockfishing. 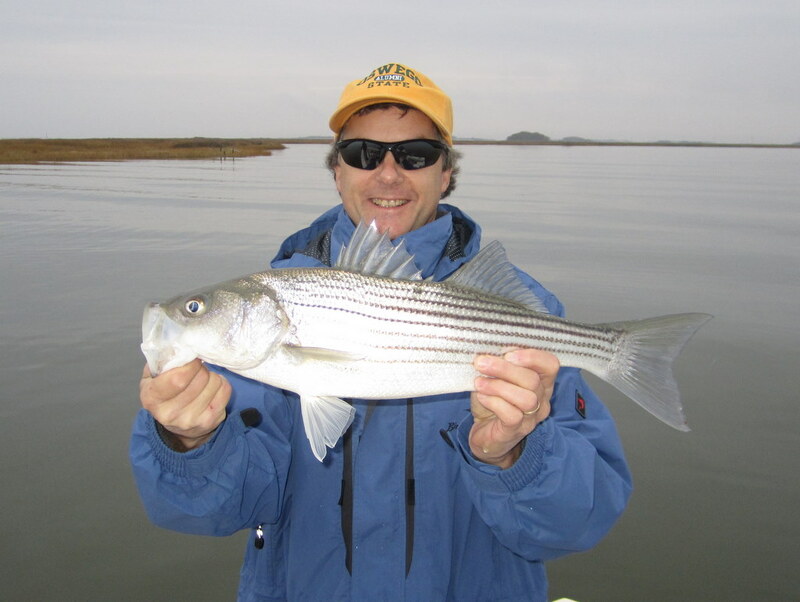 The water was ‘slick cam’ in the morning, with some very nice rockfish caught around the sod banks of Smith Island. Someone flicked the wind switch around eleven o’clock and we hit zero to 25 in the blink of an eye. Made for a fun ride home. “Part of the adventure,” Tim said. Oh, Tim did manage to catch a “Diamond Jim” fish, but when he called the number on the tag he was told the tournament had expired. Sorry Tim. 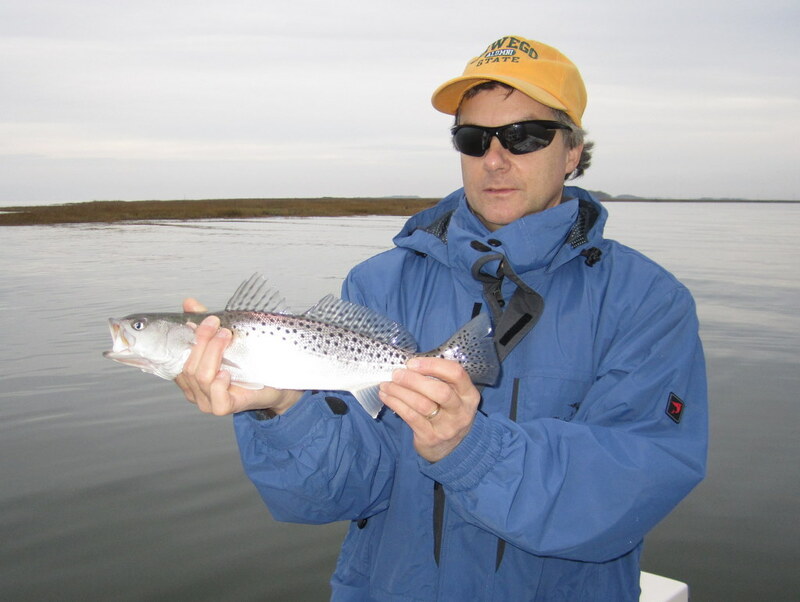 Matt King with the season's last speckled trout. What a year it was! Monday, November 7 brought Karl Bernetich and Bernie Kemp together for a walk-on trip. 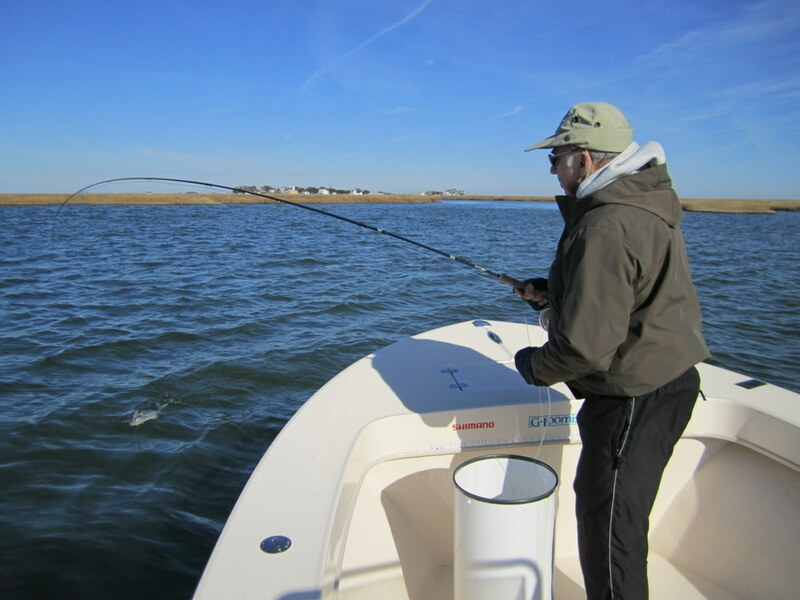 This has been a popular cost-saving program, while at the same time giving fellow anglers a chance to make new friends. I’ll act as your booking agent and make all the arrangements at no extra cost to you. 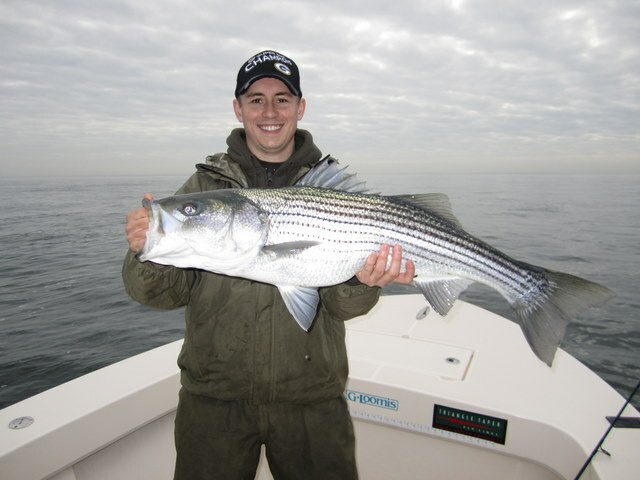 Since the program’s inception, several clients have made repeat requests to fish with the same angler. Wednesday, November 9 was a wild day, weatherwise. Dave Fetterman, his son Cory, along with Dave’s brother Kurt met me bright and early at the Somers Cove ramp in Crisfield, only to be greeted by a blanket of fog. While visibility was limited, we could see far enough to avoid a collision, so off we went. It was kind of neat actually, the GPS helped point me to a shoreline location that I wanted to fish, the sod bank would appear out of the haze, and more times than not there were rockfish waiting for our offerings. 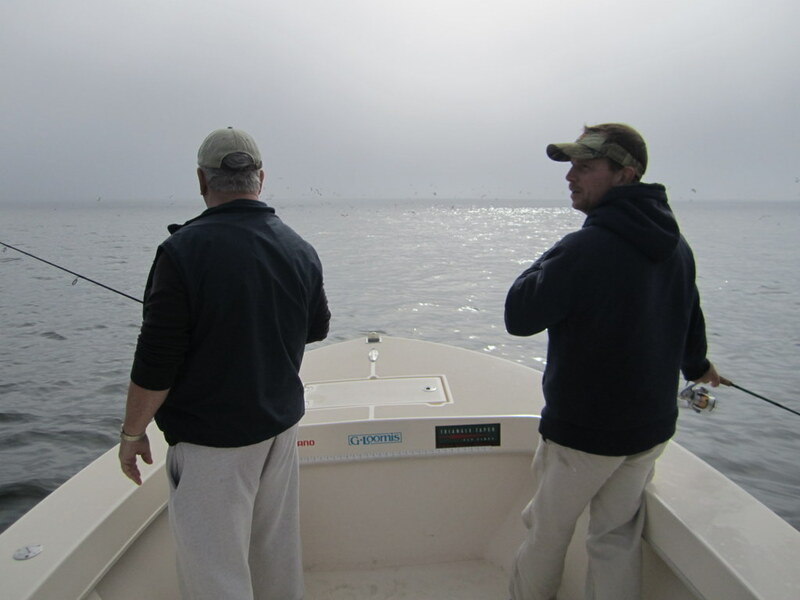 It was fun fishing and gave us a sense that we were the only boat on the sound. Later in the morning, as the sun burned-off the fog, we chased surface-feeding rockfish in the bay out near the target ship. A great day on the water with three great friends. 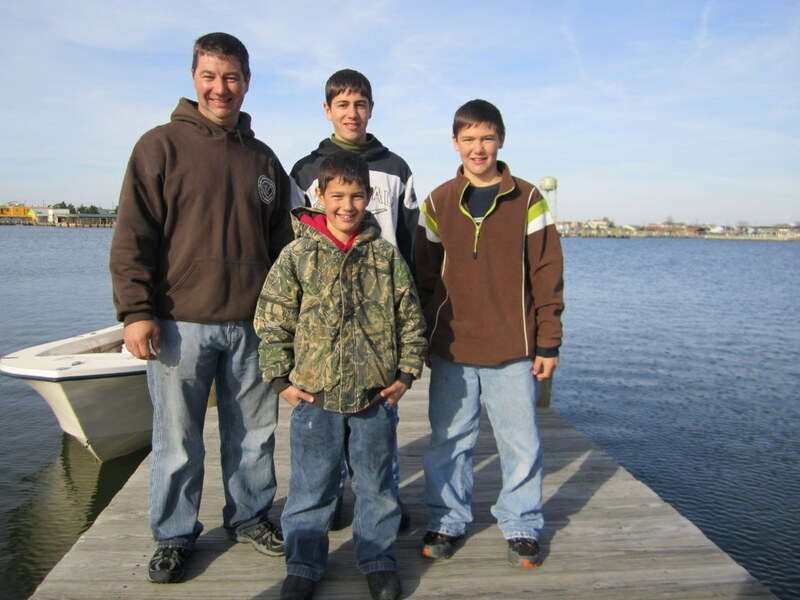 On Saturday, November 19, it was a treat for me to take Mark Horst and his three boys fishing out of Crisfield. His sons Kent, Shannon and Delvin turned out to be very good with the spinning rods. 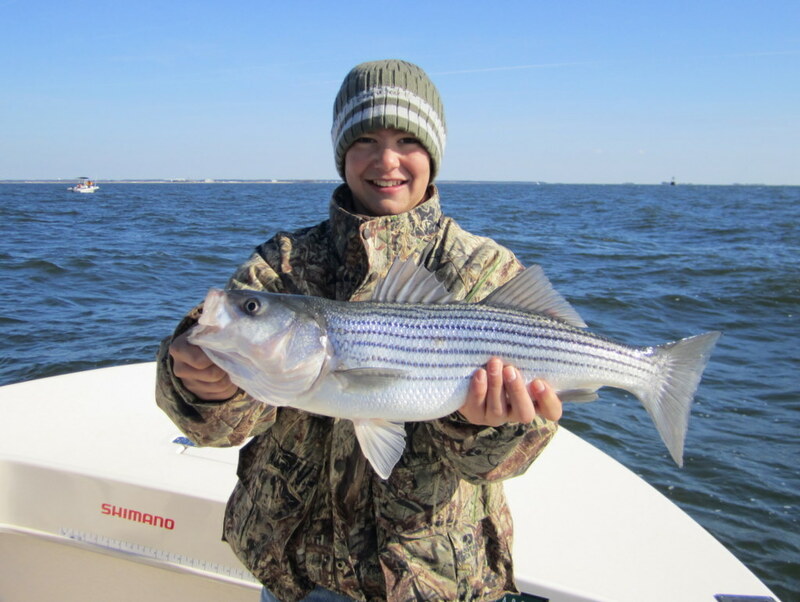 After a slow, cold morning – and a boat trip that seemed to cover Tangier Sound in its entirety – we found breaking fish right out in front of Crisfield at the infamous “Puppy Hole.” The boys had a blast pulling in rockfish to five pounds. Thanks for hanging tough guys! And the big fish of the day goes to young Delvin! Nice catch!! Mark and his sons after a fun trip! 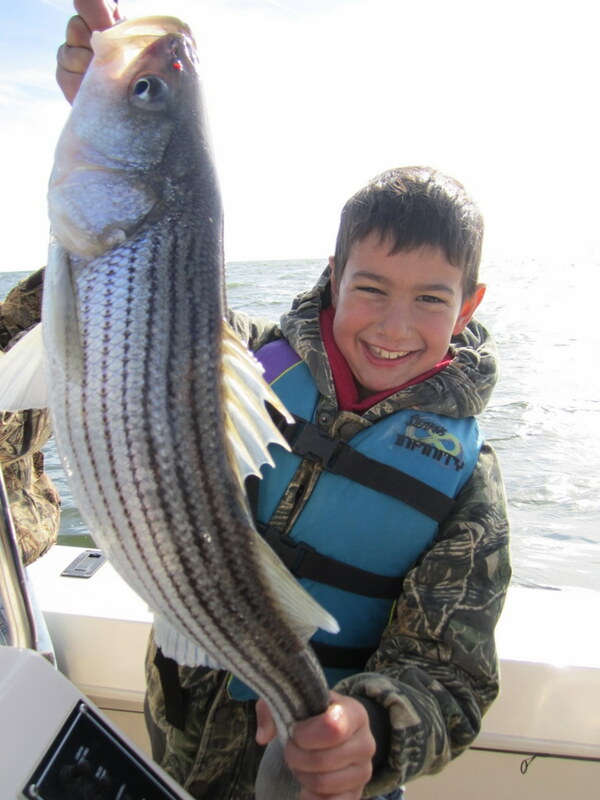 On the day after Thanksgiving, Frank Shipper, along with his two sons Chris and Ford, met me at the docks of Somers Cove Marina for a six-hour trip in search of breaking rockfish. 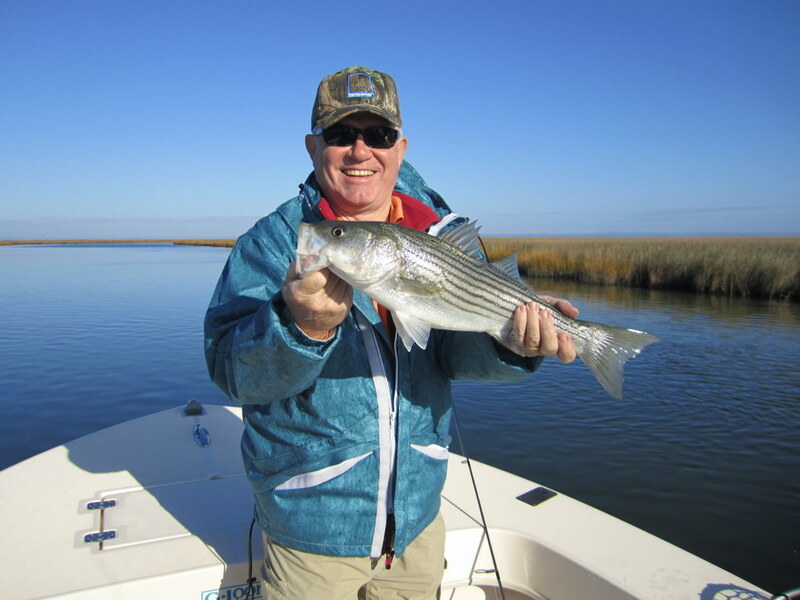 It took a good ride in the cool morning air, but we finally found the stripers just east of Tangier Island. The guys had a fun time jigging soft plastics and Li’l Bunker spoons by Specialized Baits, all-the-while catching rockfish averaging 17″ to 22.” After a couple of hours of steady action Frank says “let’s get lunch.” A hot crab cake platter at Drum Point Market in Tylerton on Smith Island was the perfect ending to a fun morning. 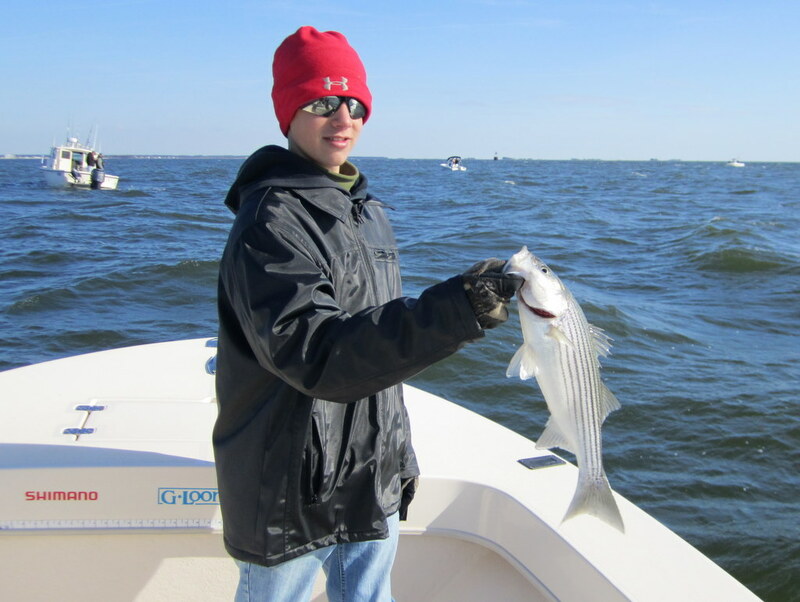 On Saturday, November 26, Justin Matoska and friend Kenny Fletcher enjoyed catching schoolie stripers on both fly and spin-tackle. 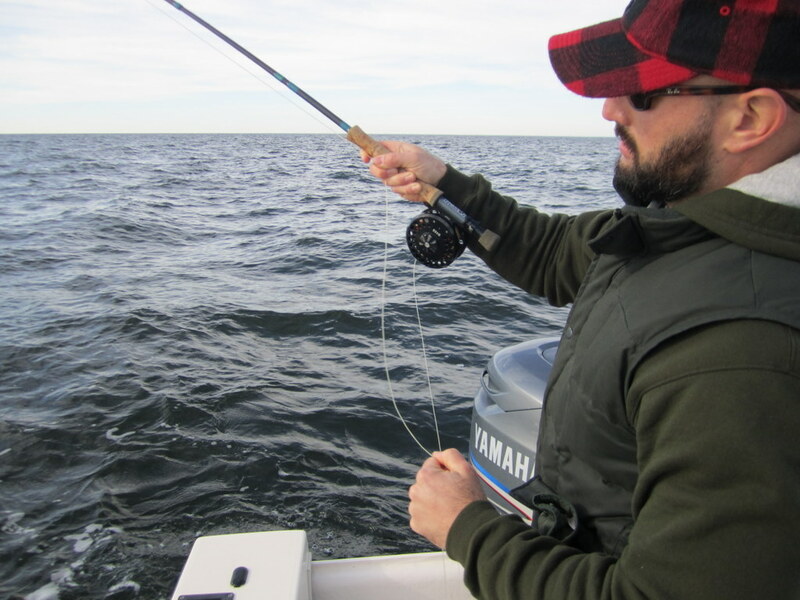 We ran into working birds pretty much everywhere we tried, which was pretty much everywhere.. Kenny managed to master the fly rod and catch his very first saltwater fish of any kind on a fly. Thanks for being a quick study Kenny. 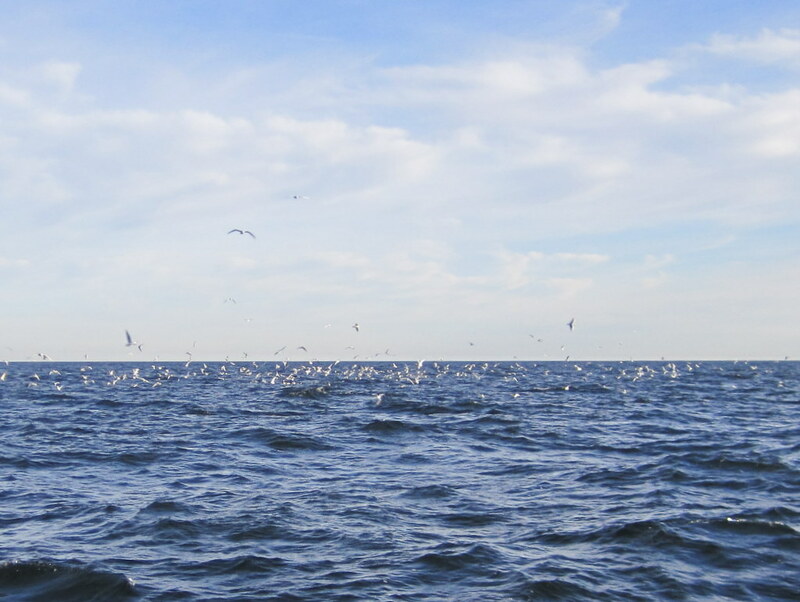 Birds working over acres of rockfish - a common sight in November! Justin trying out the G.Loomis NRX 9-wt. A real gem to cast! There is still time to purchase a last-minute stocking stuffer for the fisherman in your family. 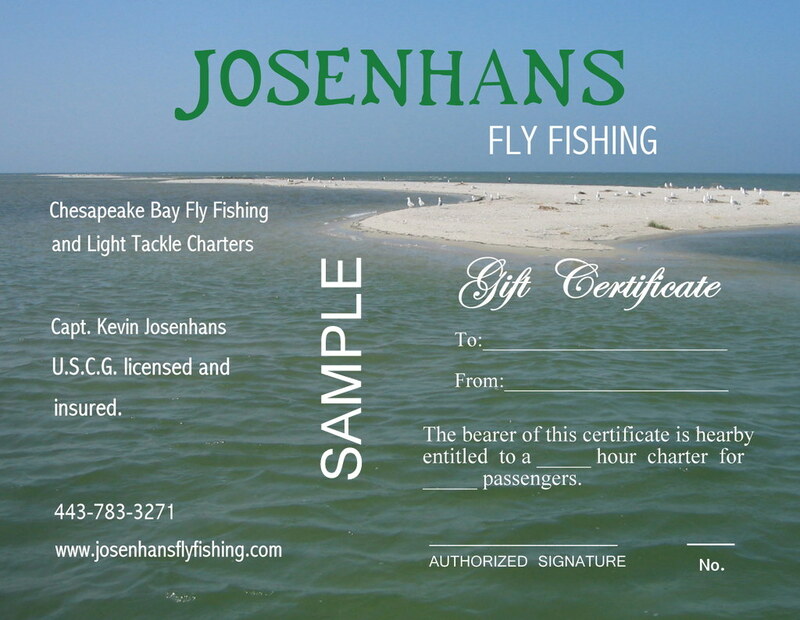 The newly minted Josenhans Fly Fishing Gift Certificate is just a phone call (or email) away, and is guaranteed to put a smile on the face of your loved one. Trip lengths of 4, 6, or 8 hours are available. Fishing license, tackle, ice, drinks and light snacks are included in the cost of the trip. Please check out my Web site at www.josenhansflyfishing.com for 2012 pricing. To place and order, please call Kevin at 443-783-3271 or e-mail at kjosenhans@aol.com. Thanks and have a Merry Christmas! !